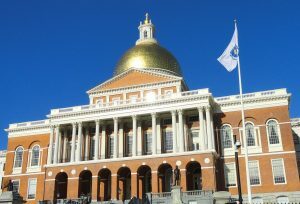 July 26, 2018 (Boston) — Massachusetts Governor Charlie Baker signed the state’s 2019 budget into law today, including a $100,000 appropriation to support Jumpstart programming across the Commonwealth. Each year, Jumpstart recruits the service of hundreds of college students and older adults across Massachusetts and trains them to deliver an evidence-based program to 2,000 preschool children in underserved communities statewide. Jumpstart’s program helps young children develop the language, literacy, and social-emotional skills they need to succeed in school while also enabling volunteers to hone their own professional skills, preparing them to be future early childhood educators and champions. The funding received from the 2019 budget will help sustain Jumpstart’s commitment to preschool children and volunteers in the underserved communities in Massachusetts where Jumpstart serves: Boston, Brockton, Lawrence, Lowell, Somerville, and Worcester. The appropriation will also enable Jumpstart to train a new class of volunteers to serve preschool children during the 2018-2019 school year and into the summer of 2019. Finally, in addition to maintaining its commitment to each of the communities above, Jumpstart is also poised to expand programming to serve children in Chelsea in 2018-2019 through its partnership with Bunker Hill Community College. We have many state leaders to thank for advocating for this cause! Jumpstart’s appropriation was championed in the State Legislature by lead amendment sponsors Representative James O’Day and Senator Patricia Jehlen, and received support from Joint Committee on Education House Chair Alice Peisch, Senate Chair Sonia Chang-Diaz, and Speaker of the House Robert DeLeo. Budget Conference Committee members led the final push to include the funding earlier this month: Senate President Karen Spilka, and Joint Committee on Ways and Means House Chair Jeffrey Sánchez, Senate Vice Chair Joan Lovely, House Vice Chair Stephen Kulik, Senate Ranking Minority Viriato deMacedo, and House Ranking Minority Todd Smola. This funding for Jumpstart demonstrates a deep commitment by state leaders at multiple levels to invest public resources in high-quality early education and the sustainability of the early childhood education workforce.